Do you ever have those days when you cannot decide what to wear? Of course you do, we all have them. Even men have them. Although I have a hunch that women have them much more often. Most likely it is our hormones. I cannot tell you how often in the past I ended up on the floor of the closest in tears (and trust me I rarely cry) because nothing fit, or nothing felt right on my body that day. My usual instinct is to always be comfortable. Presentable, but comfortable. What makes things more complicated is when I have to do a presentation, whether in front of a larger group of people, or a group of leaders. It makes me think that much more about being comfortable while also presentable. I occasionally miss the years of my life when I worked from home and my only “clothing” mission of the day was that I take a shower before Chris came home from work. I could at times go days before ever leaving the house. I do not have that luxury anymore. Each day is a new day with all of its newness, oldness, and everything in between. When I came across this photo on Pinterest, I thought “oh man that is so me.” On those days when I have to give a presentation and all I want to do is be ever so cozy, and yet I cannot be. Instead, I need to be a bit more put together. I need to be more aware of how what I wear does not distract from the ideas I am sharing or the strategy I may be rolling out. 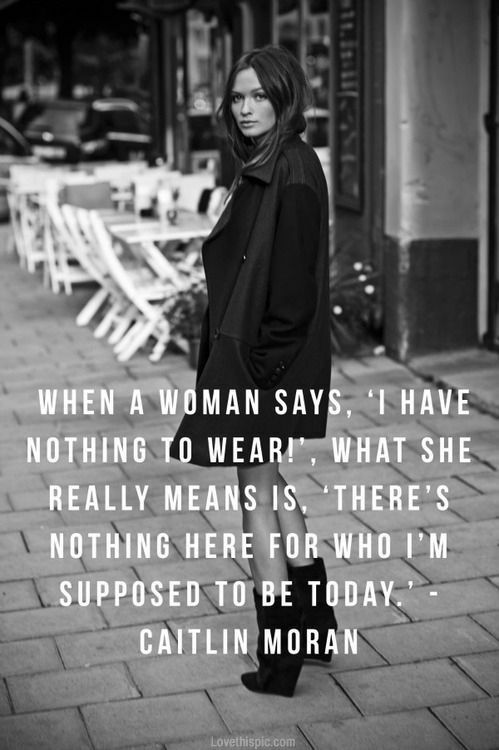 In the end, dress, clothes, and what we wear matters. That does not mean that I believe that you have to dress up, but what you put together and how you present yourself matters. Does it matter for men in the same way? Yes and no. In many ways I have seen it first hand where a guy can wear a t-shirt and jeans and it not matter if he looks less “put together” and yet if a woman wore it in the same situation she would be considered dressed down. Not fair, but at the moment it is the state of things. Embrace the days where you sit on the floor of your closet. See if you can find something that can express who you are supposed to be today, who you are, and who you want to be.